Are Couches Without Removable Cushions Good? Cushions: To remove or not to remove? This is one of the questions you must consider when buying a couch. Removable cushions allow you to vacuum crumbs, retrieve lost change, and find your spare car key that keeps disappearing; non-removable cushions ensure items aren't lost in the first place -- at least, not under any cushions. If you're unsure about which to choose, make a pros and cons list. Consider how long you plan on keeping the couch and how much you're willing to spend when making your decision. The type of couch you choose can say a lot about you. Couches without removable cushions can have numerous benefits, depending on your lifestyle. You don't have to worry about children, relatives and other guests losing items between the cushions. Whether kids are playing on the couch or you have multiple people sitting on it, your cushions won't slide around. They can't be pulled off and used as fort walls by imaginative youngsters. You can also take a nap comfortably, with your weight equally supported and distributed on the couch. If you allow eating on your sofa, non-removable cushions will prevent crumbs from getting to the inside of your couch. There are some drawbacks to having a couch without removable cushions. You can't take them off for their own protection during a move. You can't flip the cushion over to the good side in case of a bad spill, odor, stain, tearing or burns. You can't pick the cushion up to beat off any crumbs, or allow spills to run off rather than blotting after a mishap. You can't take the cushion off the couch and toss it in the washing machine, or replace cushions individually if one of them gets damaged. 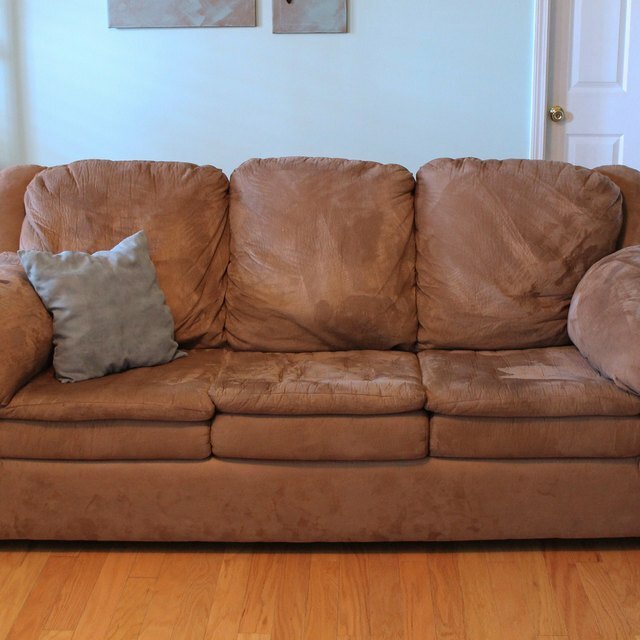 Consider your needs when deciding whether to purchase a couch without removable cushions. Many designs appear sleek and tailored, and are perfect for sitting rooms where furniture is admired and used gently. If you have a large family or small children, a couch with removable cushions might fare better for maintenance of prevention of wear and tear. To maintain a couch with non-removable cushions, clean the cushions often. Use a vacuum cleaner attachment to remove crumbs and other debris from the cracks and dips in the sofa. Treat the material with some type of stain guard. Blot and treat stains immediately rather than letting them set into the couch fabric. How Often Should You Turn Over Couch Cushions? What Kind of Area Rug Is Good for Under the Dining Table? What Is the Advantage of a Sectional Couch?